Prep your butternut squash by cutting into cubes for roasting. Take apart your garlic but keep in the skins and throw on the roasting sheet with the squash. Peel and chop your onion into large wedges to also be roasted with the squash. Mince some fresh rosemary, add to roasting pan with herbs de Provence, salt, pepper and a couple splashes of olive oil. Toss until all he squash, garlic and onions are coated evenly. Roast until golden brown and aromatic, about 35-40 minutes depending on the size of your cubes and your oven. While your squash is roasting boil your pasta per directions. In a large sauté pan put a tablespoon of olive oil. Head on medium and then add your sliced zucchini. Allow to brown on both sides and then add salt, pepper and red chili flakes if using. Add your Italian sausage and brown gently. Once your pasta is ready drain and reserve a small amount of the pasta water. 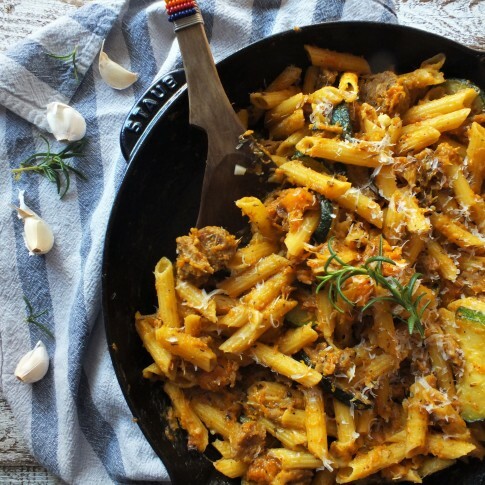 Add pasta to the pan with zucchini. I salt, pepper add olive oil to the pasta before adding the roasted squash, garlic and onions. When adding the roasted garlic be sure to squeeze it out of its skins and discard the skin. You just want the sweet roasted garlic in your sauce. Mix all together using reserved pasta water to make extra creamy. At this point you could melt the violife mozzarella into the pasta and top with grated parmesan.